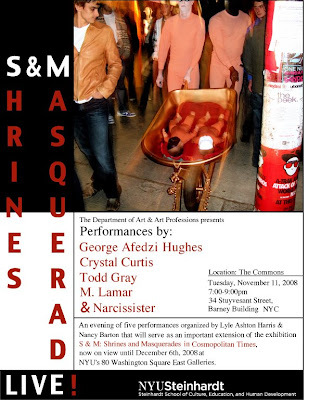 I will be participating in a performance by African artist George Afedzi Hughes tomorrow @ N.Y.U. (see details below)! I have to be at the gallery 2 hours early to take part in a rehearsal. Its been requested that we wear all black, even black shoes, but will be wearing a blue mask that features the written African symbols, reference an executioner. The performance will feature myself and four other students as we accompany George. I plan on having someone document the performance with photography and will be sure to post the documentation here. Also as per Lyle Ashton Harris’ request, I designed the above flyer which has been posted around the school and emailed as well.